Born in Uruguay, Rafael Viñoly studied architecture at the University of Buenos Aires before forming one of the largest architecture firms in South America. He eventually relocated to the United States in 1978 and founded Rafael Viñoly Architects in 1983. In the years ahead, he would come to be known around the entire world for his vision and designs. Over his 40+ year career, Viñoly and his firm’s designs have spanned North America, Latin America, Europe, Asia, Africa, and the Middle East. A Fellow of the American Institute of Architects, he’s won the Neutra Medal for Professional Excellence and an AIA Medal of Honor, amongst other honors. Some of his most significant work has taken place in New York City. The first of which was the John Jay College of Criminal Justice building in 1988. Other notable works from Viñoly and his firm include the Brooklyn Children’s Museum expansion, the Bronx County Hall of Justice, 432 Park Avenue, and the 121st Police Precinct Stationhouse. 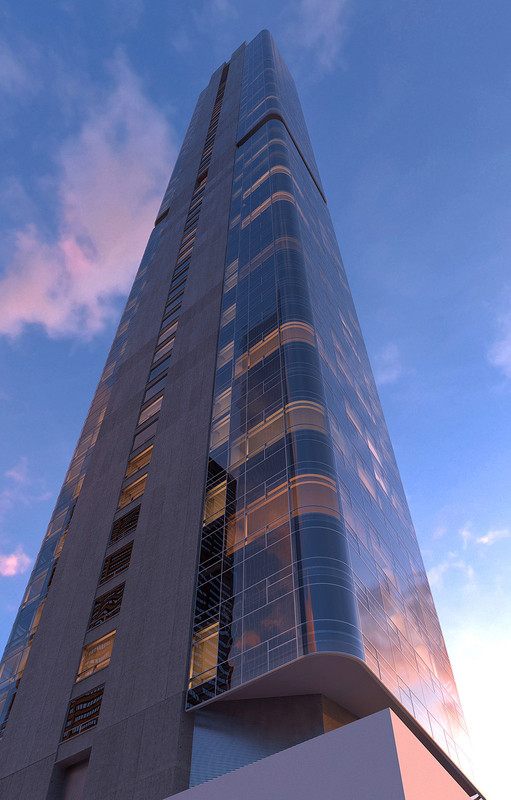 RFA was also one of the finalists in the design competition for One World Trade Center. Viñoly’s work in helping remake the look of New York City continues with 125 Greenwich Street. This residential tower developed by Bizzi & Partners Development and rising in the Lower Manhattan’s Financial District sits just two blocks south of One World Trade Center. 125 Greenwich Street does things a little differently for luxury condo buildings. While the rounded corners curve upward for 912-feet, they top out with a three-level amenity space. The structure is, at its core, built out of two side-by-side I-beams that rotate 90 degrees as they rise. That makes it resistant to wind forces while also providing bigger view opportunities looking out over Manhattan and the harbor below. With 88 floors and 273 residences total, that provides plenty of room for buyers to stretch upward. Buyers will find residences of all sizes, spanning studio to three bedrooms and from just over 400 square feet up to a little under 2,000 square feet. Understanding that there’s a balance to be made with residents of all levels, many of the studio residences can be found near the top of the structure, none of which are below the 61st floor. Kitchens and bathrooms are full of custom features, some of which are unique to the building. Calacatta Covelano marble, stone, and polished nickel line the surfaces and give everything a luxurious feel that emanates through the home. Any discussion about 125 Greenwich Street’s amenity package starts in The 88. The top three floors of the building make up this 15,000-square-feet amenities space that is sure to satisfy everything residents need or want. It starts on the 86th floor where residents can unwind from the workday in the relaxation lounge. High-backed chairs give you a comfy respite to stare out on the skyline and beyond. It’s a particularly good place to be during sunrise and sunset. When you want to gather with friends and family for a special meal, there’s a private dining room that can seat up to ten people. Afterward, gather in the screening room where you can watch a movie on a big screen from plush chairs. On the 87th floor, residents will find a 50-foot lap pool, which is surrounded by chaise lounges where you can look out on the city below through floor to ceiling windows that rise 20 feet high. The spa and sauna await on the 87th floor where residents can book an appointment for massages and therapeutic services. Finally, the 88th floor is the home of the fitness center, weight room, and yoga studio. Not only is it available 24 hours a day but it also offers state-of-the-art equipment and even has a private training room. While all the amenities are up top, the lobby also ensures that your entrance an exit from the building is a special experience every time. A chandelier hangs from the triple-height ceiling while you walk Arabescato Carrara floors below. A 24-hour concierge can help residents with just about anything they need. Or they can retire to the library and lounge area, which includes a fireplace for those chilly winter days. You would not be hard-pressed to say that 125 Greenwich Street is at the doorstep of Manhattan. Whether you’re coming or going via the Staten Island Ferry, PATH train, or NYC subway, you can connect to any of them easily. Of course, you don’t have to leave the area to experience everything the city has to offer. Nestled on the corner of Greenwich and Thames streets, residents are one block south of One World Trade Center and just a few minutes from the Hudson River and Battery Park. Whether you need to visit Brooks Brothers Dean and Deluca, or Tiffany & Co., you’ll find it nearby. Foodies have some of the city’s best spots close by to choose from, including Nobu, Jean George’s, and North End Grill. In terms of availability, 125 Greenwich Street has units for sale at every level. There are multiple studios to choose from, ranging between $975,000 and $1,550,000. One-bedroom units are available from 878 to 1,002 square feet and from $1,450,000 to $2,145,000. You’ll find two-bedrooms from 1,270 to 1,668 ranging between $2,739,900 to $3,819,900. And there are a few three bedrooms to choose from, all of which offer just over 1,900 square feet of space and range from $3,750,000 to $6,975,000. If you’re looking for luxury living in Lower Manhattan that puts you in a position to enjoy everything the city has to offer, you’ll find it at 125 Greenwich Street.